A developer has been amassing land all around the corner on which National Azabu stands, most notably the site of the former NTT training facility, which was torn down about a year ago. (They’re building some model homes on part of the site now; the rest is a large parking lot.) My bet is that the develop has made a deal with the owners of National Azabu to get their corner site, and the owners of the dozen or so small houses behind it, hopefully with the supermarket moving back in to the completed building. (And the families getting a good deal on apartments in the building?) I’m sure the supermarket’s parking would be underground or under the building now, which would be a nice development. Let’s hope the building isn’t too tall and out of character with the low-rise buildings around it. How can I come back to Tokyo without National Azabu — even if I didn’t buy much there, it IS comforting to the ex-pat population. I remember my first time going there — my husband was in Tokyo and I was visiting him. He had one pot to his name and kosher food is awfully scarce there. We spent $10 dollars on a bag of spaghetti and marinara sauce. When we lived there, I went every couple of weeks for “necessities”. Thanks Aimee for putting all of us ex-Tokyoites’ feeling towards National Azabu in this amusing tribute. Who didn’t feel like that when our husbands went off to work and leaving us to find our way around ? I lived right near the supermarket and it was such a gathering place, used to run into everyone there with their kids, esp with Baskin Robbins next to it. Along with Segafreddo on the opposite corner, that area remains one of those really special places in my memory of Tokyo. Some people might say that it was our own little expat bubble but it was really a small haven from the rest of Tokyo- not being able to mingle and not being understood. I hope they re-open for the sake of my friends who are still there ! Been shopping there since 1965. Great store and hope it reopens somewhere close by. We lived for 4 and a 1/2 years close to National. It was a lifeline for my family and me. We have now moved from Tokyo, but I cannot imagine Hiroo without National. I believe they have plans to re-open in Aug 2012. 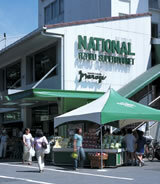 For the sake of my friends who still live in Tokyo and who regularly shop at National I do hope it re-opens. It’s since been rebuilt and reopened, slightly realigned and I think a little bit smaller inside. I’m surprised though that they didn’t build a tower in that spot with the store on the ground floor and parking below that.